Lively and peaceful schooling fish that needs a lot of free swimming space. This fish likes tot nip the fins of fishes with long fins like Angelfishes. The aquarium should be planted well on the sides and background. Don t use plants that are to soft, because they will eat them. 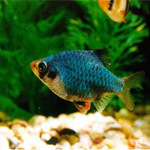 Keep with fishes of similar size and temperament and avoid long-finned tankmates, such as angelfish and bettas.